Portugal has a great tradition of tourism tours for old people. The tours to the almond blossom are the most famous. Unfortunately we do not have almond trees in Cambridgeshire so we cannot create a tour like that. But we have lots of beautiful landscapes where we can cycle. Bring your bike and let's celebrate the summer, the Cambridgeshire Countryside, and the two Portuguese cyclists that are in the Tour de France: Rui Costa and Sérgio Paulinho. We will start Saturday, the 6th at 9.30am, in front of Guildhall and we will cycle towards Ely. 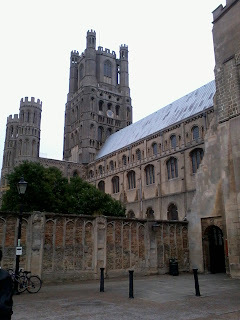 We will visit Anglesey Abbey (maybe they have Almond Flowers there), we will have a picnic in the Fens and then we will visit Ely with its famous Cathedral (Where scenes of the 'King's Speech' movie were filmed) and Oliver Cromwell's House. Then, you can come back to Cambridge by train or cycle again! This is not a race! Our peloton will be always compact and we will choose a speed that fits everyone. And there are no hills in the fens, so don't be afraid: You can do it! The tour is completely free but you must pay the tickets if you want to visit the places mentioned above. All riders in the Bike Ride to Ely do so entirely at their own risk. CUPORTSS and its agents cannot accept any responsibility for personal accident, loss, or damage to cycles, equipment and personal effects or any public liability. All riders are deemed to have accepted these conditions by entering the event. We are suggesting this particular inexpensive moped today because it's among the only Generation We Maddog scooters that provide 150cc, instead of 50cc. If you want additional power for any excellent price, this inexpensive moped might be just made for you http://www.PowerToyPlanet.com.